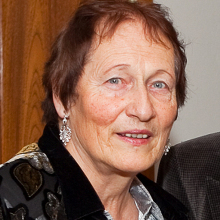 Ruth was born Ruth Michaelis in 1935 in Berlin, Germany. In 1939, aged four, Ruth and her seven-year-old brother arrived in Britian on the Kindertransport. Over the next ten years, Ruth and her brother lived with three foster families and in a hostel. Ruth's father, who was Jewish, escaped to Shanghai and her mother, who was not Jewish, remained in Germany in hiding until 1945. Ruth’s mother had taken part in the Rosenstraße protest in Berlin in which around 200 non-Jewish German women who were married to Jewish men demonstrated outside a building where many of their husbands had been interned by the Gestapo. This was the only example of a prominent public protest against the persecution of Jews in Nazi Germany. In 1949 Ruth was repatriated to Germany against her will on a court order. She could not cope in Germany as this was the second massive loss of home and everything familiar she had experienced and it took place in a country she believed was terrifying. She was back in Britain within a year and visited her parents for school holidays. After leaving university, Ruth married her Jewish boyfriend and converted to Judaism. They celebrated their golden wedding anniversary in 2008 and have 3 children and 2 grandchildren. Ruth was a secondary school teacher for 19 years and a psychotherapist for 28 years. She regularly shares her testimony in schools and colleges. And the Policeman Smiled by Barry Turner.